Very selective in its details, the King Air 350i combines the latest in aviation in an executive turboprop. Everything to make you feel free to soar higher. 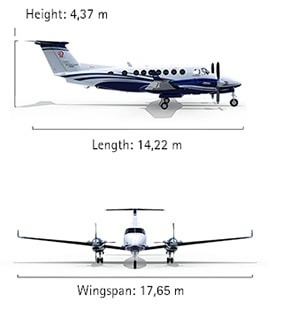 Designed to keep up with you, the King Air 350i caters to the most diverse needs. The model features the sturdiness required for more complex missions, and simplicity of operation, which allows you to land and take off on short and uneven runways. The King Air 350i comes equipped with a modern Pro Line Fusion touchscreen, which puts the most advanced navigational and situational awareness features, such as electronic charts and infographic time display at your fingertips. The King Air 350i goes above and beyond when it comes to comfort. In addition to having the largest cabin in its line, the model has a very refined interior, leather seats, and electrochromic windows, which lighten or darken individually at the command of its passengers. The 350i model maintains the traditional design of the King Air line, including the oval cabin, which brings even more comfort and convenience. The largest model in the line offers a large and spacious cabin that can comfortably accommodate up to 10 passengers.